In 10-inch nonstick skillet, heat oil over medium heat. Add onion and garlic; cook 3 to 4 minutes, stirring occasionally, until onion is tender. In medium bowl, stir broth, flour, coriander and pepper with wire whisk until blended. Slowly add to hot mixture in skillet, stirring constantly. Cook and stir 5 to 6 minutes, until mixture boils and thickens slightly. Remove from heat. Stir in sour cream until well blended. In another medium bowl, mix chicken, corn, 1/2 cup of the cheese, the chiles, cilantro and 1/2 cup of the sauce. Place 2 tortillas at a time on microwavable plate; cover with paper towel. Microwave on High 10 to 15 seconds or until softened. Spoon about 1/3 cup chicken mixture down center of each warm tortilla. Roll up tortillas; arrange, seam sides down, in baking dish. 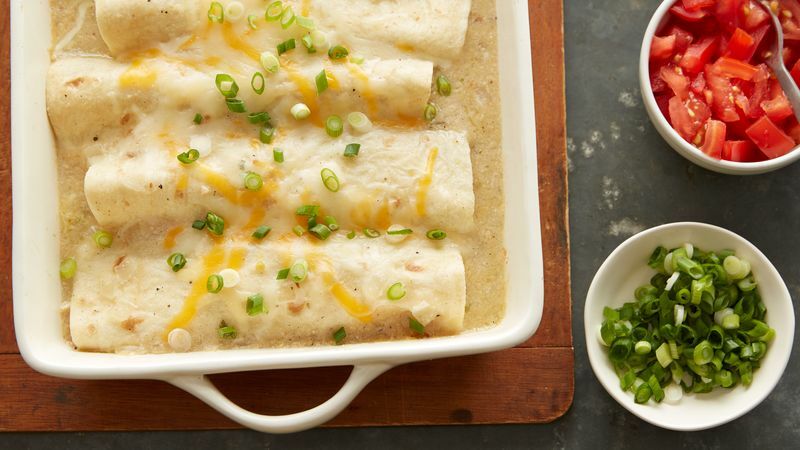 Top enchiladas with remaining sauce. Cover with foil. Bake 30 to 35 minutes or until sauce is bubbly. Remove from oven. Uncover; sprinkle with remaining 1/2 cup cheese. Let stand 5 minutes before serving. Just before serving, top with tomato and green onions. Serve with salsa. Reduced-fat mild or sharp Cheddar cheese can be substituted for the Mexican blend. Heating the tortillas until they are soft enough to roll helps prevent them from cracking.